The festivities of the Roman state religion were steeped in tradition and ritual symbolism. Sacred offerings to the gods, consultations with priests and diviners, ritual formulae, communal feasting—were all practices aimed at fostering and maintaining social cohesion and communicating authority. 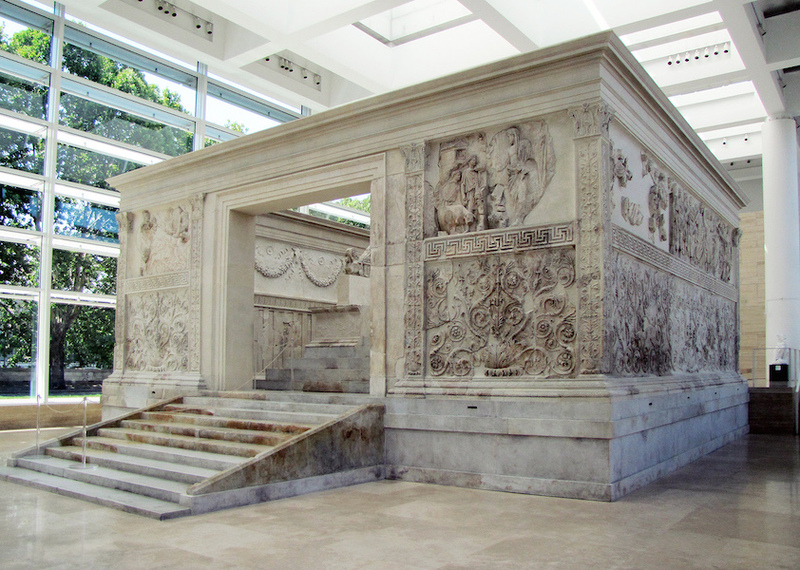 It could perhaps be argued that the Ara Pacis Augustae—the Altar of Augustan Peace—represents in luxurious, stately microcosm the practices of the Roman state religion in a way that is simultaneously elegant and pragmatic. Vowed on July 4, 13 B.C.E., and dedicated on January 30, 9 B.C.E., the monument stood proudly in the Campus Martius in Rome (a level area between several of Rome’s hills and the Tiber River). It was adjacent to architectural complexes that cultivated and proudly displayed messages about the power, legitimacy, and suitability of their patron—the emperor Augustus. Now excavated, restored, and reassembled in a sleek modern pavilion designed by architect Richard Meier (2006), the Ara Pacis continues to inspire and challenge us as we think about ancient Rome. 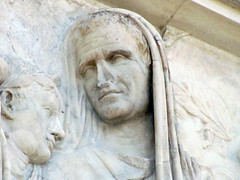 Augustus himself discusses the Ara Pacis in his epigraphical memoir, Res Gestae Divi Augusti (“Deeds of the Divine Augustus”) that was promulgated upon his death in 14 C.E. Augustus states “When I returned to Rome from Spain and Gaul, having successfully accomplished deeds in those provinces … the senate voted to consecrate the altar of August Peace in the Campus Martius … on which it ordered the magistrates and priests and Vestal virgins to offer annual sacrifices” (Aug. RG 12). 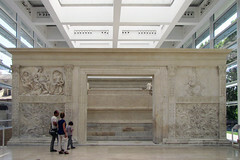 The Ara Pacis is, at its simplest, an open-air altar for blood sacrifice associated with the Roman state religion. The ritual slaughtering and offering of animals in Roman religion was routine, and such rites usually took place outdoors. 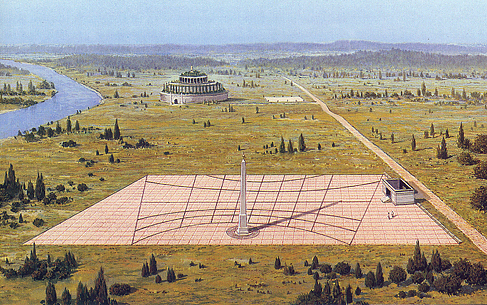 The placement of the Ara Pacis in the Campus Martius (Field of Mars) along the Via Lata (now the Via del Corso) situated it close to other key Augustan monuments, notably the Horologium Augusti (a giant sundial) and the Mausoleum of Augustus. The significance of the topographical placement would have been quite evident to ancient Romans. This complex of Augustan monuments made a clear statement about Augustus’ physical transformation of Rome’s urban landscape. 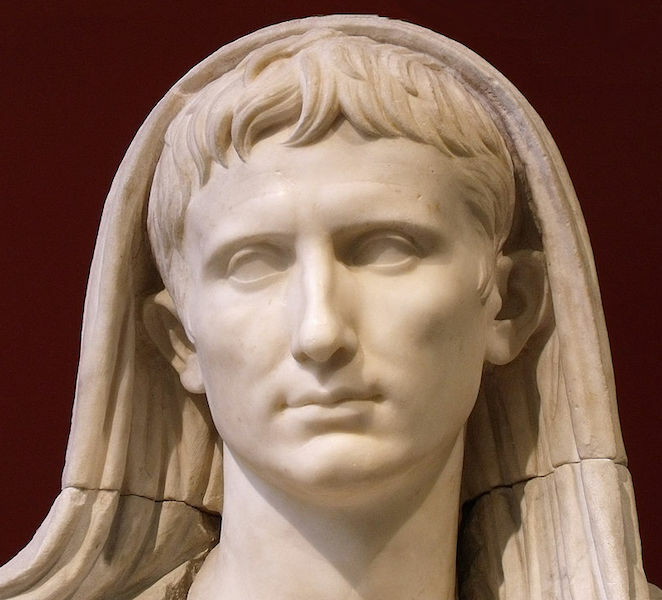 The dedication to a rather abstract notion of peace (pax) is significant in that Augustus advertises the fact that he has restored peace to the Roman state after a long period of internal and external turmoil. The altar (ara) itself sits within a monumental stone screen that has been elaborated with bas relief (low relief) sculpture, with the panels combining to form a programmatic mytho-historical narrative about Augustus and his administration, as well as about Rome’s deep roots. The altar enclosure is roughly square while the altar itself sits atop a raised podium that is accessible via a narrow stairway. Processional scenes occupy the north and south flanks of the altar screen. The solemn figures, all properly clad for a rite of the state religion, proceed in the direction of the altar itself, ready to participate in the ritual. The figures all advance toward the west. 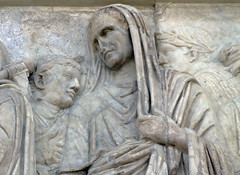 The occasion depicted would seem to be a celebration of the peace (Pax) that Augustus had restored to the Roman empire. In addition four main groups of people are evident in the processions: (1) the lictors (the official bodyguards of magistrates), (2) priests from the major collegia of Rome, (3) members of the Imperial household, including women and children, and (4) attendants. There has been a good deal of scholarly discussion focused on two of three non-Roman children who are depicted. The north processional frieze, made up of priests and members of the Imperial household, is comprised of 46 figures. The priestly colleges (religious associations) represented include the Septemviri epulones (“seven men for sacrificial banquets”—they arranged public feasts connected to sacred holidays), whose members here carry an incense box (image above), and the quindecimviri sacris faciundis (“fifteen men to perform sacred actions”— their main duty was to guard and consult the Sibylline books (oracular texts) at the request of the Senate). Members of the imperial family, including Octavia Minor, follow behind. A good deal of modern restoration has been undertaken on the north wall, with many heads heavily restored or replaced. 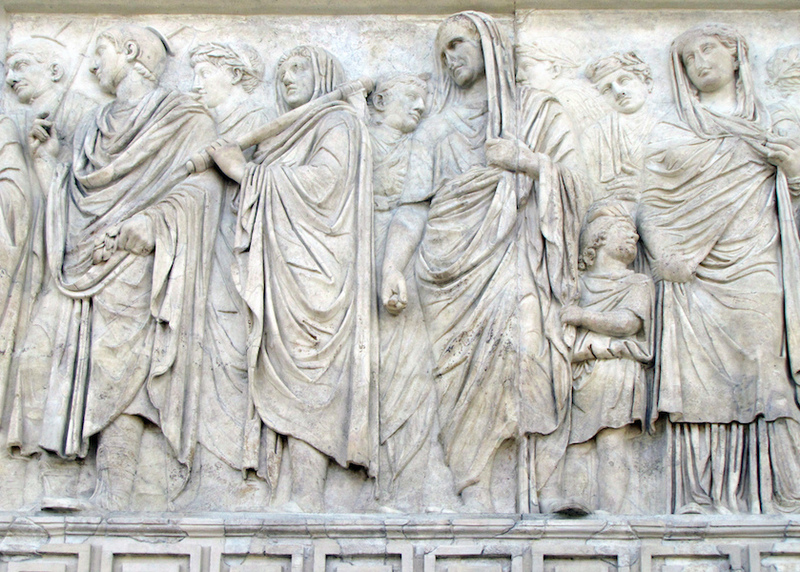 The south wall of the exterior screen depicts Augustus and his immediate family. The identification of the individual figures has been the source of a great deal of scholarly debate. 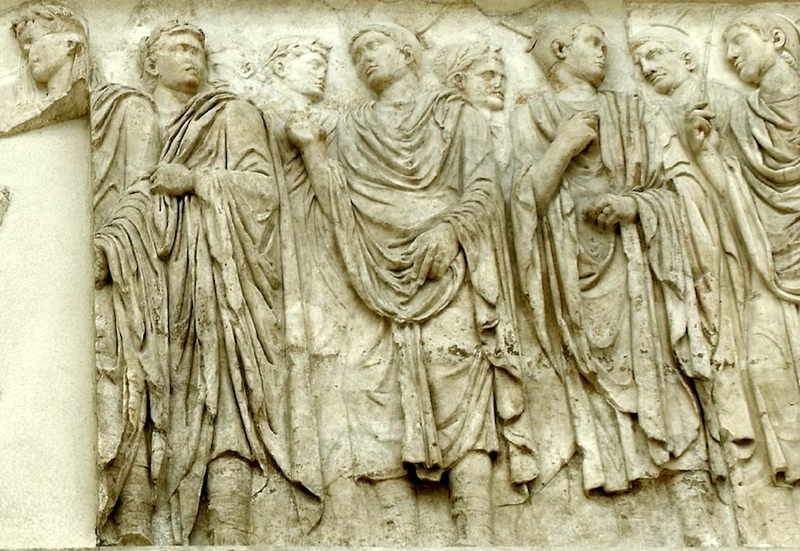 Depicted here are Augustus (damaged, he appears at the far left in the image above) and Marcus Agrippa (friend, son-in-law, and lieutenant to Augustus, he appears, hooded, image below), along with other members of the imperial house. All of those present are dressed in ceremonial garb appropriate for the state sacrifice. The presence of state priests known as flamens (flamines) further indicate the solemnity of the occasion. 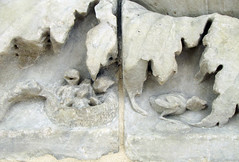 A running, vegetal frieze runs parallel to the processional friezes on the lower register. 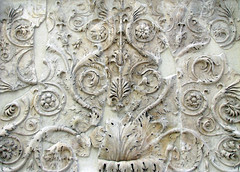 This vegetal frieze emphasizes the fertility and abundance of the lands, a clear benefit of living in a time of peace. and a fragmentary panel showing Roma (the personification of Rome) as a seated goddess. 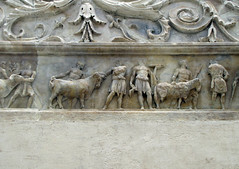 Since the early twentieth century, the mainstream interpretation of the sacrifice panel (above) has been that the scene depicts the Trojan hero Aeneas arriving in Italy and making a sacrifice to Juno. A recent re-interpretation offered by Paul Rehak argues instead that the bearded man is not Aeneas, but Numa Pompilius, Rome’s second king. In Rehak’s theory, Numa, renowned as a peaceful ruler and the founder of Roman religion, provides a counterbalance to the warlike Romulus on the opposite panel. The better preserved panel of the east wall depicts a seated female figure (above) who has been variously interpreted as Tellus (the Earth), Italia (Italy), Pax (Peace), as well as Venus. The panel depicts a scene of human fertility and natural abundance. Two babies sit on the lap of the seated female, tugging at her drapery. Surrounding the central female is the natural abundance of the lands and flanking her are the personifications of the land and sea breezes. In all, whether the goddess is taken as Tellus or Pax, the theme stressed is the harmony and abundance of Italy, a theme central to Augustus’ message of a restored peaceful state for the Roman people—the Pax Romana. The altar itself (below) sits within the sculpted precinct wall. It is framed by sculpted architectural mouldings with crouching gryphons surmounted by volutes flanking the altar. The altar was the functional portion of the monument, the place where blood sacrifice and/or burnt offerings would be presented to the gods. The implications of the Ara Pacis are far reaching. Originally located along the Via Lata (now Rome’s Via del Corso), the altar is part of a monumental architectural makeover of Rome’s Campus Martius carried out by Augustus and his family. Initially the makeover had a dynastic tone, with the Mausoleum of Augustus near the river. 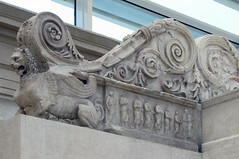 The dedication of the Horologium (sundial) of Augustus and the Ara Pacis, the Augustan makeover served as a potent, visual reminder of Augustus’ success to the people of Rome. The choice to celebrate peace and the attendant prosperity in some ways breaks with the tradition of explicitly triumphal monuments that advertise success in war and victories won on the battlefield. By championing peace—at least in the guise of public monuments—Augustus promoted a powerful and effective campaign of political message making. 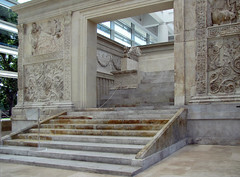 The first fragments of the Ara Pacis emerged in 1568 beneath Rome’s Palazzo Chigi near the basilica of San Lorenzo in Lucina. These initial fragments came to be dispersed among various museums, including the Villa Medici, the Vatican Museums, the Louvre, and the Uffizi. 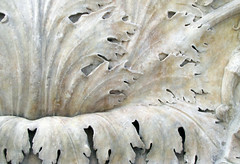 It was not until 1859 that further fragments of the Ara Pacis emerged. The German art historian Friedrich von Duhn of the University of Heidelberg is credited with the discovery that the fragments corresponded to the altar mentioned in Augustus’ Res Gestae. Although von Duhn reached this conclusion by 1881, excavations were not resumed until 1903, at which time the total number of recovered fragments reached 53, after which the excavation was again halted due to difficult conditions. Work at the site began again in February 1937 when advanced technology was used to freeze approximately 70 cubic meters of soil to allow for the extraction of the remaining fragments. This excavation was mandated by the order of the Italian government of Benito Mussolini and his planned jubilee in 1938 that was designed to commemorate the 2,000th anniversary of Augustus’ birth. The revival of the glory of ancient Rome was central to the propaganda of the Fascist regime in Italy during the 1930s. Benito Mussolini himself cultivated a connection with the personage of Augustus and claimed his actions were aimed at furthering the continuity of the Roman Empire. Art, architecture, and iconography played a key role in this propagandistic “revival”. Following the 1937 retrieval of additional fragments of the altar, Mussolini directed architect Vittorio Ballio Morpurgo to construct an enclosure for the restored altar adjacent to the ruins of the Mausoleum of Augustus near the Tiber river, creating a key complex for Fascist propaganda. Newly built Fascist palaces, bearing Fascist propaganda, flank the space dubbed “Piazza Augusto Imperatore” (“Plaza of the emperor Augustus”). 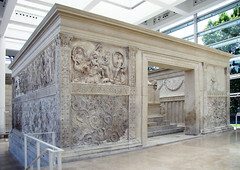 The famous Res Gestae Divi Augusti (“Deeds of the Divine Augustus”) was re-created on the wall of the altar’s pavilion. The concomitant effect was meant to lead the viewer to associate Mussolini’s accomplishments with those of Augustus himself. 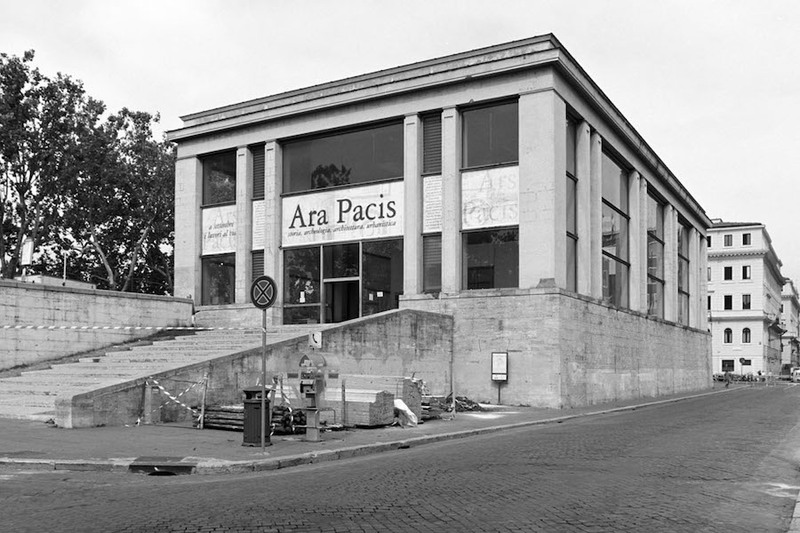 The firm of architect Richard Meier was engaged to design and execute a new and improved pavilion to house the Ara Pacis and to integrate the altar with a planned pedestrian area surrounding the adjacent Mausoleum of Augustus. Between 1995 and the dedication of the new pavilion in 2006 Meier crafted the modernist pavilion that capitalizes on glass curtain walls granting visitors views of the Tiber river and the mausoleum while they perambulate in the museum space focused on the altar itself. The Meier pavilion has not been well-received, with some critics immediately panning it and some Italian politicians declaring that it should be dismantled. The museum has also been the victim of targeted vandalism. 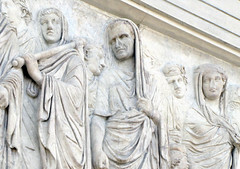 The Ara Pacis Augustae continues to engage us and to incite controversy. As a monument that is the product of a carefully constructed ideological program, it is highly charged with socio-cultural energy that speaks to us about the ordering of the Roman world and its society—the very Roman universe. Augustus had a strong interest in reshaping the Roman world (with him as the sole leader), but had to be cautious about how radical those changes seemed to the Roman populace. While he defeated enemies, both foreign and domestic, he was concerned about being perceived as too authoritarian–he did not wish to labeled as a king (rex) for fear that this would be too much for the Roman people to accept. So the Augustan scheme involved a declaration that Rome’s republican government had been “restored” by Augustus and he styled himself as the leading citizen of the republic (princeps). These political and ideological motives then influence and guide the creation of his program of monumental art and architecture. 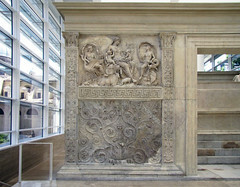 These monumental forms, of which the Ara Pacis is a prime example, served to both create and reinforce these Augustan messages. 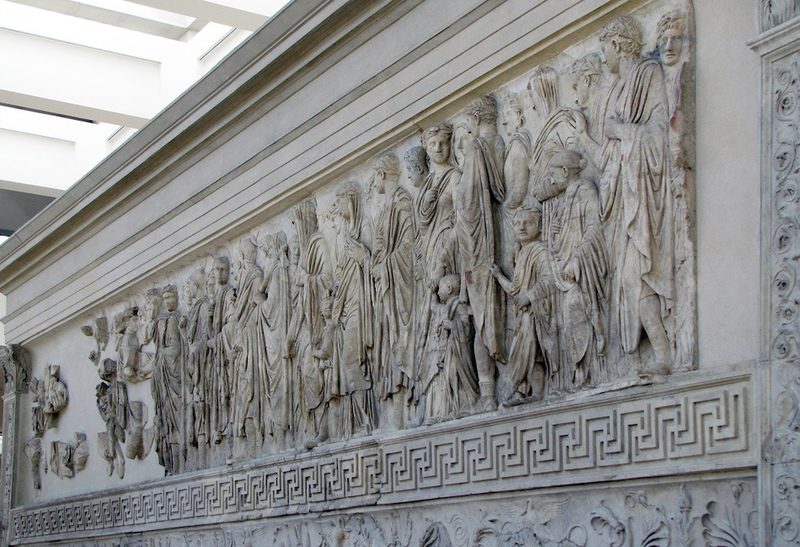 The story of the Ara Pacis become even more complicated since it is an artifact that then was placed in the service of ideas in the modern age. This results in its identity being impossibly, a mixture of Classicism and Fascism and modernism—all difficult to interpret in a postmodern reality. It is important to remember that the sculptural reliefs were created in the first place to be easily readable, so that the viewer could understand the messages of Augustus and his circle without the need to read elaborate texts. Augustus pioneered the use of such ideological messages that relied on clear iconography to get their message across. A great deal was at stake for Augustus and it seems, by virtue of history, that the political choices he made proved prudent. 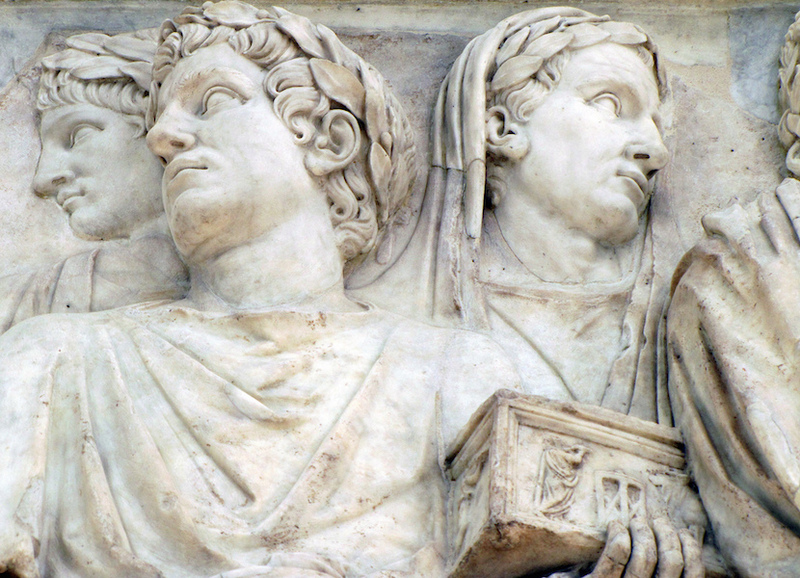 The messages of the Pax Romana, of a restored state, and of Augustus as a leading republican citizen, are all part of an effective and carefully constructed veneer. What was the Pax Romana? David Castriota, The Ara Pacis Augustae and the Imagery of Abundance in Later Greek and Early Roman Imperial Art (Princeton: Princeton University Press, 1995). 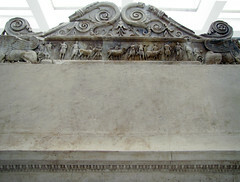 Diane A. Conlin, The Artists of the Ara Pacis: the Process of Hellenization in Roman Relief Sculpture (Chapel Hill: University of North Carolina Press, 1997). 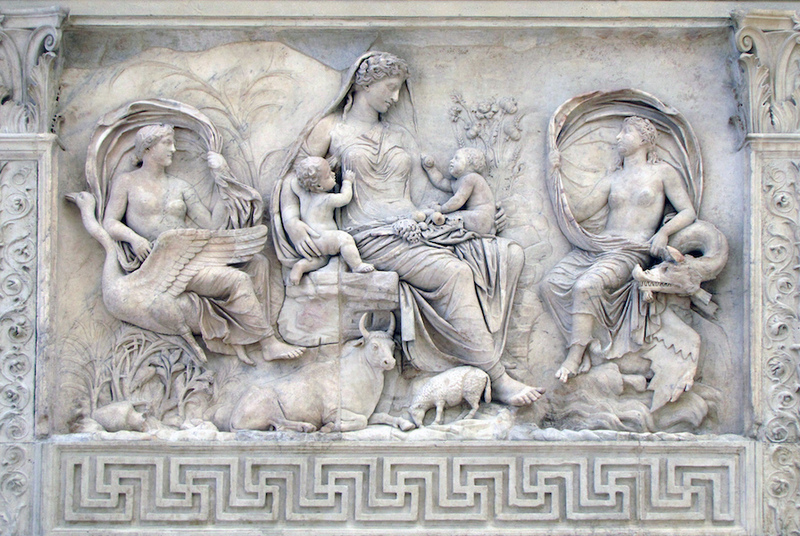 Nancy de Grummond, “Pax Augusta and the Horae on the Ara Pacis Augustae,” American Journal of Archaeology 94.4 (1990) pp. 663–677. Karl Galinksy, Augustan Culture: an Interpretive Introduction (Princeton: Princeton University Press, 1996). Karl Galinksy ed., The Cambridge Companion to the Age of Augustus (Cambridge: Cambridge University Press, 2005). Peter Heslin, “Augustus, Domitian and the So-called Horologium Augusti,” Journal of Roman Studies, 97 (2007), pp. 1-20. 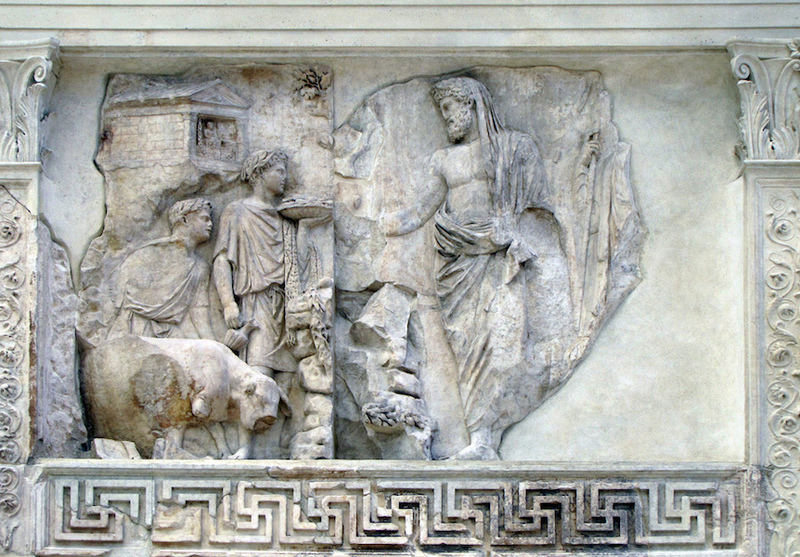 P. J. Holliday, “Time, History, and Ritual on the Ara Pacis Augustae,” The Art Bulletin 72.4 (December 1990), pp. 542–557. Paul Jacobs and Diane Conlin, Campus Martius: the Field of Mars in the Life of Ancient Rome (Cambridge: Cambridge University Press, 2015). Diana E. E. Kleiner, Roman Sculpture (New Haven: Yale University Press, 1994). Gerhard M. Koeppel, “The Grand Pictorial Tradition of Roman Historical Representation during the Early Empire,” Aufstieg und Niedergang der römischen Welt II.12.1 (1982), pp. 507-535. Gerhard M. Koeppel, “The Role of Pictorial Models in the Creation of the Historical Relief during the Age of Augustus,” in The Age of Augustus, edited by R. Winkes (Providence, R.I.: Center for Old World Archaeology and Art, Brown University; Louvain-La-Neuve, Belgium: Institut Supérieur d’Archéologie de d’Histoire de l’Art, Collège Érasme, 1985), pp. 89-106. Paul Rehak, “Aeneas or Numa? 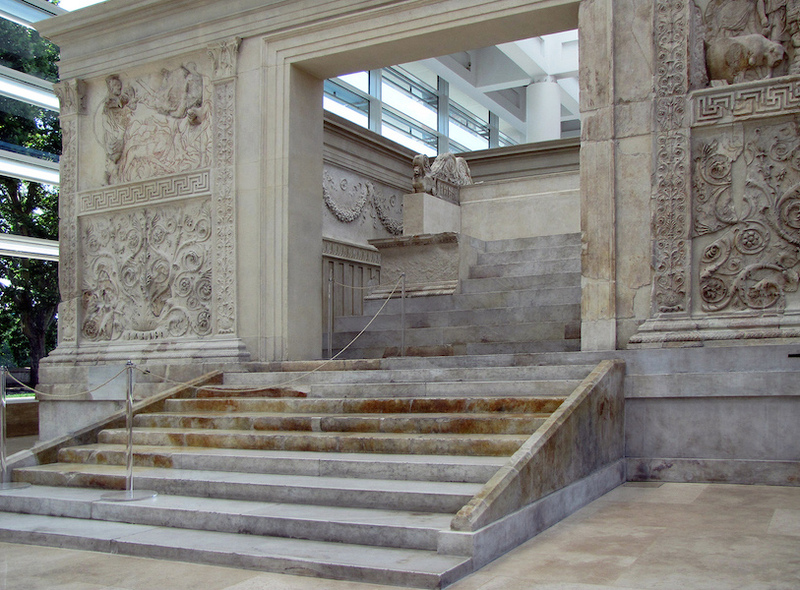 Rethinking the Meaning of the Ara Pacis Augustae,” The Art Bulletin 83.2 (Jun., 2001), pp. 190-208. Paul Rehak, Imperium and Cosmos. Augustus and the Northern Campus Martius, edited by John G. Younger. (Madison, WI: The University of Wisconsin Press, 2006). 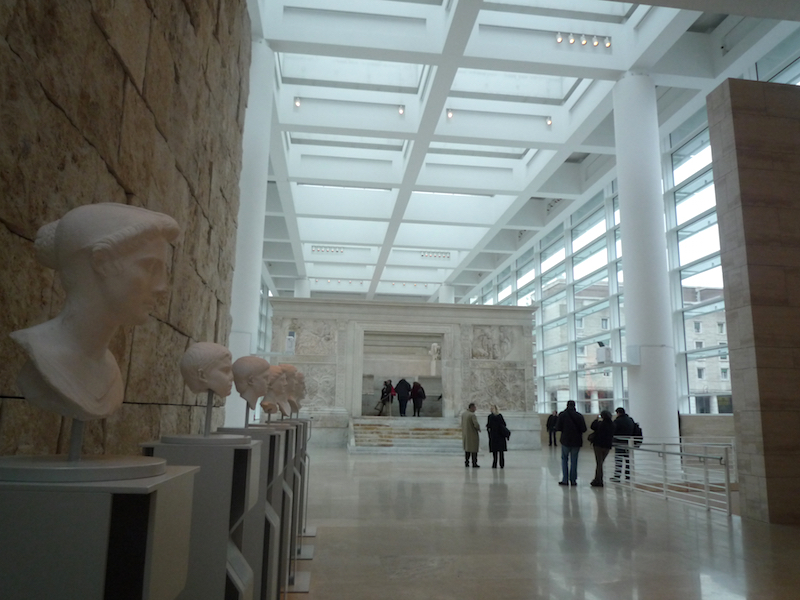 Alan Riding, “Richard Meier’s New Home for the Ara Pacis, a Roman Treasure, Opens,” The New York Times April 24, 2006. John Seabrook, “Roman Renovation,” The New Yorker, May 2, 2005 pp. 56-65. 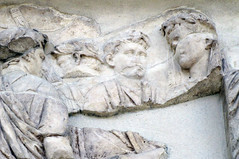 J. Sieveking, “Zur Ara Pacis,” Jahresheft des Österreichischen Archeologischen Institut 10 (1907). Catherine Slessor, “Roman Remains,” Architectural Review, 219.1307 (2006), pp. 18-19. M. J. Strazzulla, “War and Peace: Housing the Ara Pacis in the Eternal City,” American Journal of Archaeology 113.2 (2009) pp. 1-10. Stefan Weinstock, “Pax and the ‘Ara Pacis’,” The Journal of Roman Studies 50.1-2 (1960) pp. 44–58. Rolf Winkes ed., The age of Augustus: interdisciplinary conference held at Brown University, April 30-May 2, 1982 (Providence, R.I.: Center for Old World Archaeology and Art, Brown University; Louvain-La-Neuve, Belgium: Institut Supérieur d’Archéologie de d’Histoire de l’Art, Collège Érasme, 1985). Paul Zanker, The Power of Images in the Age of Augustus, trans. D. Schneider (Ann Arbor: University of Michigan Press, 1987). Cite this page as: Dr. Jeffrey A. Becker, "Ara Pacis," in Smarthistory, November 23, 2015, accessed April 21, 2019, https://smarthistory.org/ara-pacis/.